LankaWeb – The boy in the Bunker – Faked Photo or real? The boy in the Bunker – Faked Photo or real? “A series of photographs taken a few hours apart and on the same camera, show Balachandran Prabhakaran, son of Villupillai Prabhakaran, head of the Liberation Tigers of Tamil Eelam (LTTE). 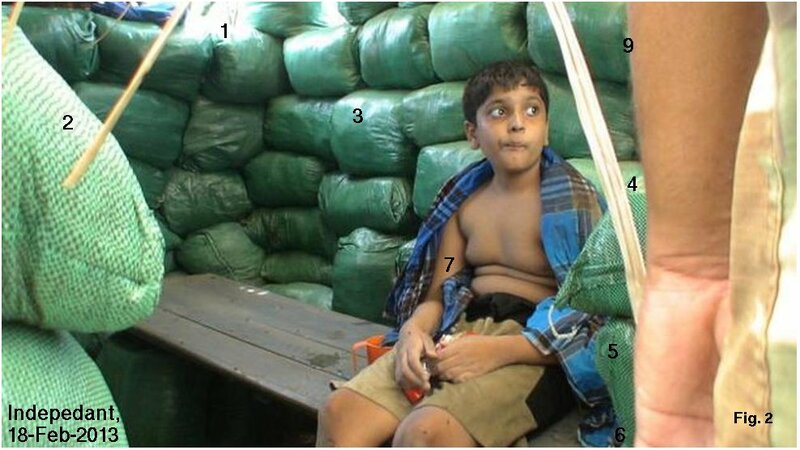 One of them shows the boy sitting in a bunker, alive and unharmed, apparently in the custody of Sri Lankan troops. Another, a few hours later, shows the boyƒÆ’†’¢ƒÆ’‚¢”…¡¬ƒÆ’‚¢”…¾¢s body lying on the ground, his chest pierced by bullets” (http://www.independent.co.uk/news/world/asia/handed-a-snack-and-then-executed-the-last-hours-of-the-12yearold-son-of-a-tamil-tiger-8500295.html) The new picture is shown below, as Fig. 2 where we have numbered certain locations for the purpose of discussion. These allegations have been rejected by the Lankan government. To what extent are the claims valid? Since these are serious allegations, it is important to examine the veracity of the `evidence’ presented by the Independent which collaborates closely with Channel-4 and British Tamil Advocacy groups. What raises suspicions is the surfacing of this picture after one year, with the claim that it is part of a successive footage from the same camera. Are there any other photos? Figure 2 clearly shows that the light comes to this under-ground bunker from the area numbered 1, and radiates towards 2, 3 etc. Nevertheless, the there are hardly any shadows consistent with the light source around the boy’s body or the head area. A blow-up of the region around the left shoulder of the child shows that, far from there being any type of shadow, a shoddy job of colour filing has been done along the edge of the shoulder. The shadow seen in the sand bags just left of number 9 indicates what to expect. Furthermore, the shadow of the edge of blanket near no. 7, on the arm, is completely in the wrong direction. Furthermore, the end of the bench to the left off no. 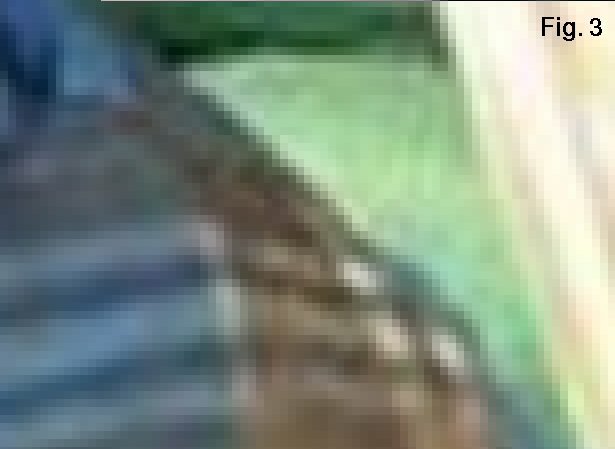 6 does not show the planks, but appears to have been worked over on the initial canvas using graphic tools, totally obliterating the type of texture of the wood planks seen to the right of the boy. It is also important to compare very carefully the trouser worn by the boy lying dead on the ground, shown below. The narrow black flap on the pocket cover is 16-18 cm long and narrow, with a width of 4cm. On the other hand, the trouser worn by the boy seated on the wooden plank has a pocket flap which is much wider. The artist, in positioning the boy seems to have drawn the flap in a way different from that on the trouser of the boy dead, and laying on the ground. Two pictures of the boy sitting in the bunker have been published. If the pictures in the bunker are authentic, then the picture of the dead boy wearing a similar but different trouser is inconsistent with the claims of these British reports. Hence the new picture raises troubling questions about the way photos are being used as `evidence’ in an age where sophisticated graphic tools are readily available even to a child. Of course, the Tigers are well known to be past masters of publishing fake photos. Many pictures of Prabhakaran posing in groups with black tigers, or blown up bodies attributed to the army were published in the Tamil Net from as early as 10 years before the demise of the Tigers. After the demise of Prabakaran, Tamil sources published the now well known image of Prabhakaran sardonically watching his death announced on TV (see Fig. 4 below). The British press has been rubbished for its devious ways many times recently, not only with respect to the Rupert Murdoch investigations, but with respect to many other scandals. The close associations of the producers of Channel-4 movies with key ex-LTTE UK-Tamils are well known. Clearly then, it is important that the British press authority or some other public watch dog requires that the sources of information be revealed in court and their veracity established transparently, in front of a suitable authority so that public can have some confidence of what they are shown.It is just not enough for reporter to say that `new evidence’ has turned up, or that some unnamed `experts’ have reviewed the material. Or, is it simply like expert-certified 100% beef lasagna turning out to be 100% horse meat? Channel 4 and its “journalists” should be taken to court by the Sri Lankan government. Then these morally-bankrupt jokers will be financially bankrupt, too. You are worng ! The slipper belongs to Gothabhaya Rajapakse and the Shoe ( this is not an army boot by any means, as Fonseka bought barnd new boots very frequently) belong to Mahinda rajapakse and the shadow of tha man I recognise as Basil Rajapakse, all war criminals ! I can’t imagine how these idiots consider SriLankans to be so primitive monkeys ! This is a disgrace to US, British and the lot. The boy is posing, he is not dead. Photographs are heavily edited and some one scrubbed the metadata (amateurish work) but we have extracted deep layers and it got dates indicating PS job done in Jan 2013. As author indicated touching has been done almost all over the body edge area.. If they want to take this serious we need RAW camera data and this will verify the whole truth.. Question is why did they scrubbed the metadata layer? Baluchandran looks like a dwarf in the bunker. Tamil racism, the worst in the world. “India’s southern Tamil Nadu state refused on Thursday to host the Asian Athletics Championships because of the participation of Sri Lanka which it accuses of war crimes. Chennai, the state capital, was due to host the event in July, but Tamil Nadu chief minister J. Jayalalithaa said Sri Lanka must not be allowed to take part. Jayalalithaa, whose state has a large Tamil population, accuses the Indian Ocean island nation of committing “genocide” against its Tamil minority. British PM David Cameron said some months ago that most of the troubles in the world today is due to the British. Thank you for stating the truth, Mr Cameron. Also note the fact that the British brought in some ONE MILLION Tamil people into Sri Lanka during the British Colonial times to work in the British tea plantations as Indentured Labor. These Tamil people have yet to integrate into Sri Lanka mainstream life. They still lead an insular life due to Caste diktats. The half Million Tamils brought in by the Dutch to work the tobacco plantations of the North have caused enough problems too, starting with and due to Caste matters. Prabhakaran, the ltte leader, was a product of the North’s Caste problem. Sri Lanka would never have faced the present day problems if Tamil Indentured Labor had not happened via Colonists. Plus Tamil Illegal Migration into Lanka from TN due to TN’s Caste/poverty problems. It is also time to tell the truth to the world that Tamil Caste Wars are being fought in Sri Lanka, not in Tamil Nadu where it all starts. Tamil Nadu Chief Minister, Jayalalitha, is afraid that the spotlight of Tamil Caste Discrimination will turn on Tamil Nadu and is desperately pointing the figure at Sri Lanka and is calling for economic sanctions on Sri Lanka. Sri Lanka’s war against ltte terrorism was a just war, as we all know. Pity that Sri Lanka has to face the flak for Tamil Nadu weaknesses. correction : read ‘figure’ as finger. The boy in the bunker was eating a parcel of food in the footage that BBC aired- purpotedly he is in the army bunkers being looker after and fed by the army. Why would the army want to look after a child for a few days and then kill him? Didn’t they want to shoot him while he was hungry? Give him a nice bath and give him a tasty packet of rice to eat and may be let him have little game of hide and seek and then shoot him?!!!!! WTF? Secondly, does the boy look like a child whose father has just been killed in the most violent fashion just a few days/ hours ago? Good grief! Some white people actually get duped by these amateur tricks! – The ones that are easiest to dupe have deeply held subconcious views that the white race is the superior race and must police the colored nations, because the colored nations if left to manage themselves are prone to evil. Even if they are nice to your face and preach about equality of all races, deep down, this is their motivating idea. This was one of the original motivating forces for colonialism and its vestiges are alive and well in the modern human rights movement and the United Nations. When the LTTE publishes articles in the West and gets propoganda films made, etc they are fully aware of this trait in the average white person and they make maximum use of it. That and goebellsian suggestion. This entry was posted on Wednesday, February 20th, 2013. You can follow any responses to this entry through the RSS 2.0 feed. You can skip to the end and leave a response.